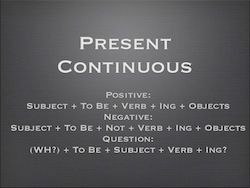 The present continuous tense, also known as the present progressive, is one of the most commonly used verb tenses in English. It is one that English learners frequently confuse with a similar tense, the present simple. She's reading in the garden now. They're not standing in the rain. They're waiting in the garage. Alice doesn't have to get up early on Saturdays. The boys play soccer on Friday evenings. The present continuous is used only with action verbs. Actions verbs express things that we do. The present continuous is not used with stative verbs that express a feeling, belief, or state of being, such as "hope" or "want." Correct: I hope to see him today. Incorrect: I am hoping to be seeing him today. Correct: I want some ice cream right now. Incorrect: I am wanting some ice cream right now. She isn't coming on Friday. We're working on the Smith account at the moment. This tense is also used for future plans and arrangements, especially in business. Where are you staying in New York? She isn't coming to the presentation on Friday. I'm flying to Tokyo next week. I'm (I am) working today. You're (You are) studying English at the moment. He's (He is) working on the report today. She's (She is) planning a vacation in Hawaii. It's (It is) raining right now. We're (We are) playing golf this afternoon. You're (You are) not paying attention, are you? They're (They are) waiting for the train. For negative sentences, conjugate the helping verb "be," then add "not" plus "ing" to the verb's end. I'm not (I am not) thinking about my vacation right now. You aren't (You are not) sleeping at the moment. He isn't (He is not) watching the TV. She isn't (She is not) doing her homework today. It isn't (It is not) snowing today. We aren't (We are not) staying in New York. You aren't (You are not) playing chess at the moment. They aren't (They are not) working this week. For sentences that ask a question, conjugate "be," followed by subject and a verb ending in "ing." What are they doing this afternoon? Cars are being made in this factory at the moment. English is being taught by the teacher now. Steak is being eaten by the people at table 12. Want to learn more about the present continuous tense? Check out this teacher's guide for additional exercises and tips.